Marts Tomorrow is a Free to Play MMORTS by mobile devices and borwser-based HTLM5, here you can read the updates for Mars Tomorrow by Bytro Labs. A new year is breaking and especially the red planet will change a lot in 2019. We've tweaked and twitched around and optimized the game mechanics and monetization on Mars over the last few months, so new players on Mars are getting along faster and better, and have more options to invest their terrestrial capital. ● Safe limit at low levels has been increased. ● The client now logs out after 6 hours of inactivity not 6 hours after gamestart..
● Costs for the upcoming phase packages are now always visible. ● Turbos will overheat the transporters now and it will automatically be switched off to cool down for a while in order to activate the turbo again. ● Effects of stock levels have been reduced. ● Claim bonus has been increased. ● In the case of tenders, only the 1st place wins the main prize (container / tritium). Those placed behind receive MarsDollar, Research Points or energy. 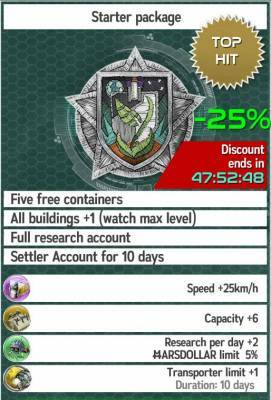 ● For the immediate completion of building construction (cost 15 tritium) during the tutorial you will now receive 20 Tritium Reward. ● Missing MarsDollar capital can be compensated by the use of Tritium. ● A transporter who delivers gets no penalty by low stock levels. ● Transporter will not fall to 99% or below immediately after its repair. Source Bytro Labs - Mars Tomorrow Cross-Platform MMO Free2Play Game.